Tailgating is a long standing tradition before football games. 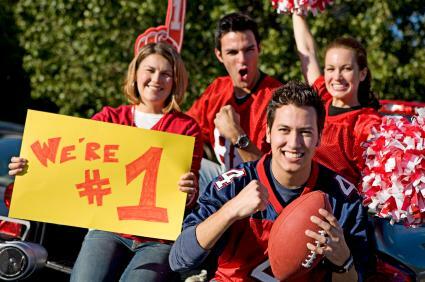 There is no better way to show your enthusiasm and support than by getting your friends together before the big game. Be creative with some tailgate party ideas to add extra fun to your football game festivities. Once you invite your friends and family to cheer on your home team with a great football party invitation, the next step is to find a great place to hold a tailgate party. You can hold a party at various locations including your home, yard or driveway or in the parking lot outside of the stadium, if it is permitted. Other tailgate party ideas include packing plenty of water, bringing along trash bags, and including an emergency kit. No tailgate party is complete without good food and drinks. Be sure to bring buns and condiments to complete your grilling creations. A popular idea is to hold a potluck. Ask everyone to bring an item. Be sure to have all areas covered so you do not end up with a bunch of hot dogs and nothing else. Assign people to different areas, such as have one person bring dessert and another bring a side dish. Plan your potlucks around the main dish. Chili is a popular tailgating item. It can be eaten as is or used on your hot dogs and nachos. People can bring nacho chips, cheese, sour cream, and bread to complement the chili. Pulled pork can also be made ahead and brought to make sandwiches. Traditional picnic foods, like salads and vegetable dishes, make great potluck sides. Quench your thirst with a cooler filled with beer, soda and water. If it is a cold day, bring a thermos filled with coffee, tea, or hot chocolate. #1 fan contest: The person who is dressed in the most team gear and has the most enthusiastic look is the winner. Consider face paint, clothing and hats as part of the wardrobe. The winner could get a prize such as a team mug or pendant. Team trivia: Write down questions about your team and whoever answers the most correctly is the winner. Active games: Have fun running around and playing games such as football or Frisbee. Not only do these games keep you on your feet but they give you an opportunity to meet others who are tailgating as well. Be sure to follow safety rules when playing games at a tailgate. According to John Drengenberg, Consumer Safety Director for Underwriters Laboratories (UL), there are many ways to keep safe while having fun at a tailgate. For example, he notes that tossing a ball around near a hot grill has the potential for serious injury. That is why keeping children and others away from the grill when it is hot is one of the most important rules. Keep this in mind when planning tailgate games and activities. Since weather can often be unpredictable, try to bring some protection from the elements. Whether it's umbrellas or a portable tent, be well prepared so nothing can get in the way of your fun. Have someone in charge of the grill so they can keep an eye on it at all times. Also keep the grill away from vehicles since today, cars and trucks are constructed with a lot of plastic materials, not to mention the gasoline and oil. Be sure to have a fire extinguisher and spray bottle of water nearby. A spritz of water can extinguish flare-ups quickly without damaging your tailgate food. 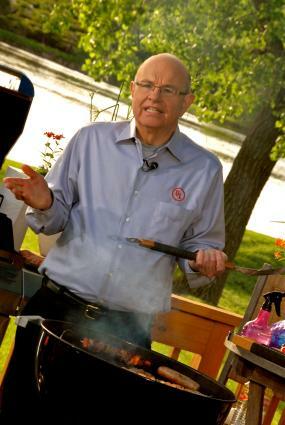 If you're using a charcoal grill, don't use gas or kerosene to start the grill. Not only might the food taste bad, but doing this could cause a fire or explosion. If you're using a gas grill, never start it with the lid closed because it causes gas to build up inside creating a possible exploding hazard. Finally, never add charcoal igniter fluid after the coals have started to burn. Decorating your area in your team's colors to liven up the event. Bringing along some fun items such as a banner, homemade signs and streamers. Playing music to get you all in the mood and ready to cheer on your home team. John Drengenberg notes that outside decorations like team-spirited tents and banners add a festive touch, but they also provide fuel for a fire. What's more, today's décor is often made of synthetic materials that burn fast and hot, so keep them far from the grilling area. The most important thing, other than staying safe, is to take into consideration who will be at the tailgate. 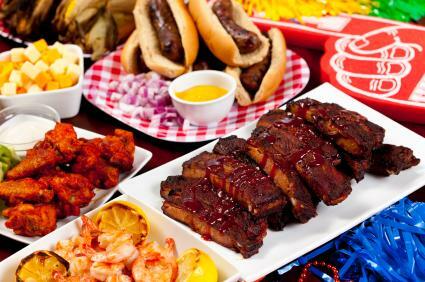 Tailor your food and activities around your guests and offer something for everyone to enjoy, and your tailgate is sure to be a success.